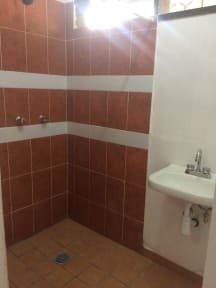 Hostal Tzalahua i Manzanillo, Mexico: Reservér nu! Cancellation 7 days before arrival or no show automatically will be charged 50% of the total amount of the rent. If the cancellation is made 1 month before the date of arrival 25% of the total rent is going to be charged. If the cancellation is made before the 31 days of the arrival date or more, the hostel will charged only 10% of the total amount. Hostal Tzalahua is located in the most centric spot of Manzanillo. Perfect location for your stay in Manzanillo. The property offers great services and facilities. The property is surrounded by a beautiful green garden and there is a large swimming pool, some hammocks and a big terrace with TV, perfect to relax and spend a good time in Manzanillo. Breakfast is not served at this property but next door you will fine the best tacos for breakfast. Hostal Tzalahua is only 100 meters from the beach and 3 minutes by foot from restaurants, bars, grocery stores, hospitals, cafes and some fast food places. Manzanillo is a well-known resort destination, famous for its climate. The weather in Manzanillo is pleasant year-round. Check-in time starts at 14:00 hours. Check-out time is 12 hours. For your information: if a bill is requested, 16% VAT will be applied.